In the end-of-school-year craziness, I haven’t been cooking as much. Way more take-out than usual, which is fine and tasty and fun but not as budget- or waistline-friendly, though, as always, lots and lots and lots of grace for whatever season we (you!) are in. Last week, however, I found a few pockets of time to make special food to make that last school week, well, special. I made fruit tarts, one with apples and another with nectarines, both topped with peach jam infused with lemon zest and juice and fresh chopped ginger… Oh my! I made banana muffins. I made pancakes with berry sauce. Hmm, it sure looks like my go-to treats are breakfast-snacky, and carb-y, huh? They’re also all long gone. Yesterday, I got back to dinner. To make a big pot of enchilada sauce (find the recipe here) I first mixed up a batch of chili powder from the spices in my drawer! I’ve regularly had a store-bought blend but had run out. So I googled it, and as it turns out, chili powder consists of more than just ground chilis: cumin, garlic and onion powder, paprika, oregano. Honestly, I’d rather use the spices I already buy to create blends than buy pre-made versions. That way I’ll use up my spices within their best-taste window and have fresher, tastier blends. Another time I might try a recipe that starts with dried chilis, but for now this was easy. Once the enchilada sauce was simmering, I got to work on Potato Enchilada Pie. The origin for this recipe came from Forks Over Knives. Living in California, we eat a lot of Mexican food. 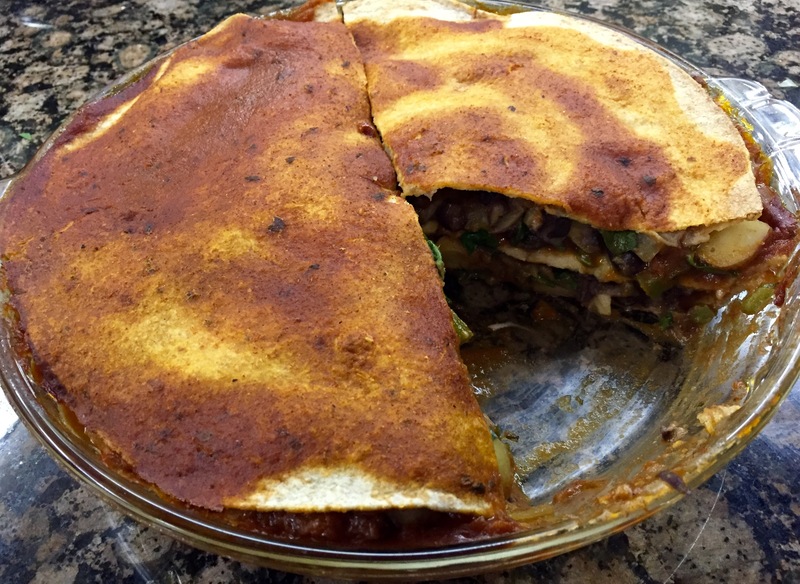 Before I leaned plant-based, I regularly made enchiladas, but even when I loaded them up with veggies they still contained cheese. Without resorting to soy-cheese I despaired of finding a recipe as satisfying. This one does the trick! I’ve modified the recipe to make it easier and to add black beans. You could also add other veggies, like corn or bell peppers, but in this case I think simple might be best. Add all spices to a small bowl and mix them. Store in a clean and dried spice bottle for up to six months. Boil the potatoes for 5-7 minutes until almost fork-tender. In a large pan, saute onions for three minutes, stirring frequently. Add garlic and saute for two more minutes. Add jalapenos and cook for one minute. Add chili powder, beans, and cooked potatoes and mix well. Add spinach and cook for one minute. Preheat oven to 350. Add sauce to bottom of a pie pan to cover. Top with one tortilla; cover with half the filling. Drizzle with more sauce. Repeat layers: tortilla, filling, sauce, tortilla, and sauce to cover. Bake for 25 minutes. Dress with desired garnishes and slice into wedges. One of the reasons I love making this recipe is that I have multiple dinners built in: I will use the extra enchilada sauce later in the week to make another of our favorites: Tofu Chilaquiles.